Chalet de Marat comes with its own plot (800sqm) and offers 220sqm of living space on 3 levels : 5 en-suite bedrooms, 2 cars garage + possibility to finish a space of 40m² (named cave on the plans) for sauna, home cinema, gym, etc. The chalet is finished to a high standard and is missing only the kitchen, which we can organise when needed. Chalet de Marat in Praz sur Arly is situated in a residential area close to the pistes and its traditional Alpine design mixes perfectly with its immediate surroundings. It is bathed in natural light and the living room is spacious and the sleeping capacity is superb as it offers 5 ensuite bedrooms, one of them a master suite. It is also a new-build so you benefit from reduced legal fees as well as the new-build guarantees. Chalet de Marat also comes included in the price with a double closed garage, its own 800m2 plot and hydraulic heating. These brand new (yet to be released) apartments Le Petit Alaska in Val d’Isère are a great opportunity to own a trophy property in Val D’Isere, one of the most popular ski resorts in the world. 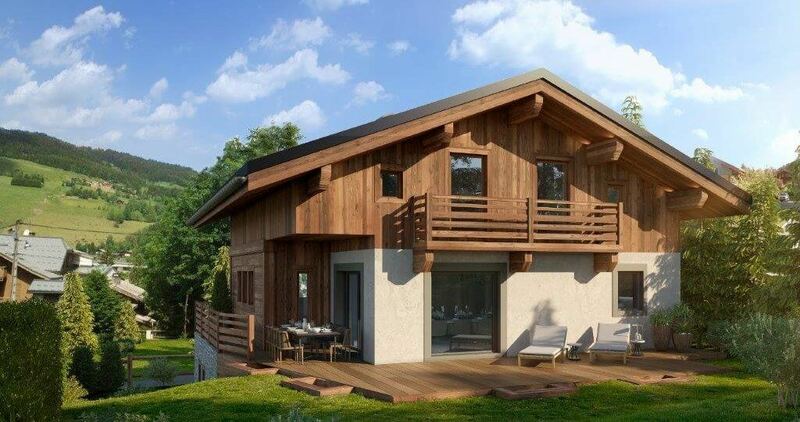 Thought out by one of the most renowned real estate developers in the Alps, these 8 new luxury apartments for sale range from 52 to 160m² and have two to four bedrooms (some with additional cabins & bunk beds). Thought out to the smallest detail, the interior design will perfectly combine tradition and modernity. The wooden doors are hand-made, giving the space a unique and very Savoyard atmosphere while the facilities are ultra modern. Le Petit Alaska will meet the highest demands of the international clientele. Most of the apartments at Le Petit Alaska benefit from good sized outdoor spaces, allowing the future owners to enjoy magnificent views of the mountains and village. While most apartments in this beautiful stone building, wood and lauze benefit from bright interior spaces (mostly south-facing for maximum light), the penthouse located on the second and third (last) floor will boast a very high ceiling (4metres), wide windows overlooking two large terraces facing south and east and 4 large bedrooms, each with their ensuite bathroom. A cave (storage room), a parking space and a ski room come with each of these properties. Le Petit Alaska is located in a strategic part of Val d’Isere, just 300m from the centre with its many restaurants, shops and bars and only a few minutes walk from the ski lifts. The return by skis is a few meters from the building, allowing you to make the most of the ski area. The price per square meter of Le Petit Alaska is very competitive for the level of quality and finishes it offers, thus making it all the more attractive for French and international investors. Le Little Alaska is also a safe investment for anyone wishing to enjoy their apartment during the high season or rent it during their absence. The ski resort welcomes more and more tourists each year and records on average one million nights a year, making short-term rentals very popular and profitable. In addition, thanks to the Tignes Glacier, there is enough snow to ski in the summer so you can easily rent between June and August. New apartments are often popular with vacationers and these properties in particular will ensure high profitability. “This is a well-priced property as it is a 5-bedroom chalet close to the pistes also ready for delivery”. Chalet also comes with nice 800m2 plot so you can create a nice garden. In the winter, the family resort puts on its white mantle and offers a vast choice of activities, starting with skiing and other snow sports. It is situated at the beginning of the Espace Diamant domain which connects 6 resorts and offers 185 km of pistes!